The membership of these three new members was announced this morning during a wildlife-watching event that took place in the Deelerwoud/Veluwezoom area. 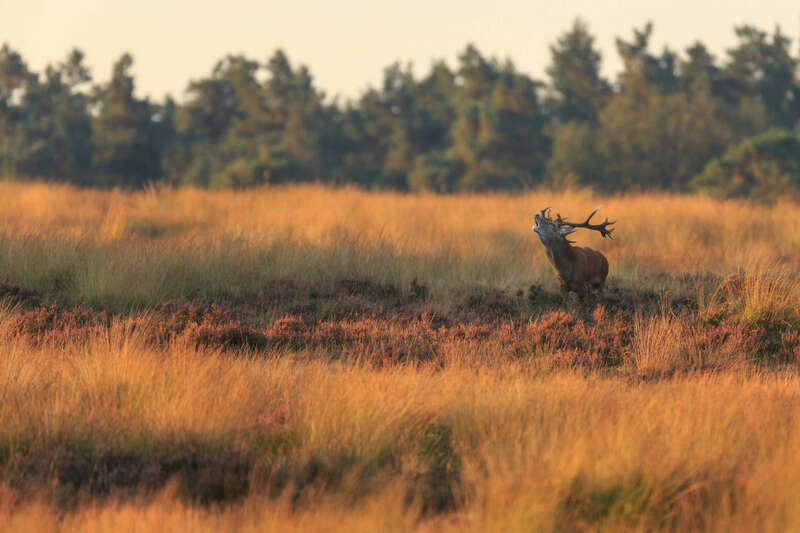 While observing wildlife such as red deer, fallow deer and other species, Natuurmonumenten Conservation Director Teo Wams explained the society’s approach to wildlife management in this area. 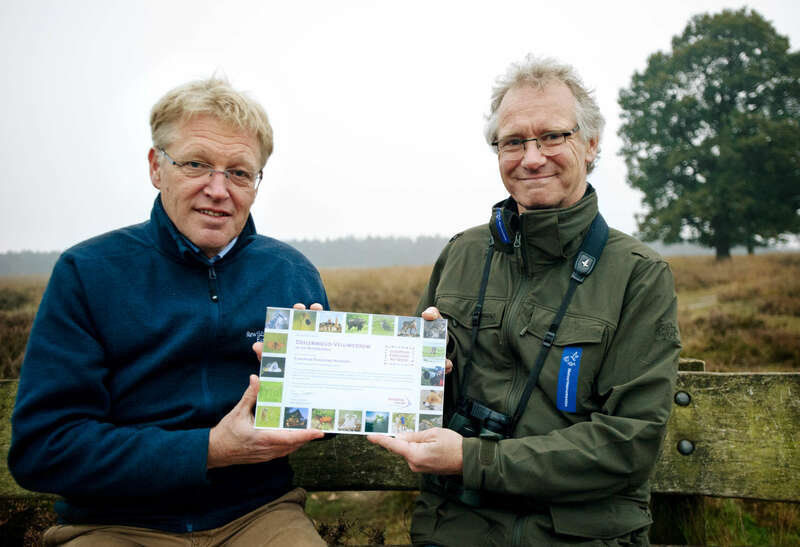 After the wildlife watching event, Frans Schepers, Managing Director of Rewilding Europe, handed over the official membership certificate for the Deelerwoud/Veluwezoom to Teo Wams. “The Netherlands is a country where rewilding has been pioneered over the last 30 years, on many different topics. It is great to see that Natuurmonumenten has now brought three great rewilding examples into the European Rewilding Network. This will allow Natuurmonumenten to connect to the wider rewilding movement that is taking shape, and in turn can also learn lessons from other areas in Europe and apply those in its own areas,” said Frans Schepers. The European Rewilding Network was launched in October 2013 at the World Wilderness Congress (WILD10) in Salamanca (Spain) with 25 member areas. Over the past two years the Network has further expanded; with the three new Dutch sites of Natuurmonumenten, it now numbers 41 members in 18 different European countries. The Netherlands now counts five ERN member areas; apart from the three areas announced today, these are the Millingerwaard (province of Gelderland) and Kraansvlak (province of Noord-Holland). In the three new member sites of ERN, Natuurmonumenten is proactively working on new management approaches to these landscapes. In each of the new member sites Deelerwoud/Veluwezoom (2,500 hectares), Drents-Friese Wold (1,070 hectares) and the transboundary Kempen~Broek (25,000 hectares) Natuurmonumenten favours natural processes as an important management principle, such as the restoration of river dynamics and natural grazing and the creation of natural corridors including ‘green bridges’ crossing highways. In the Deelerwoud/Veluwezoom area, a novel way of wildlife management started in 2001 with the establishment of a hunting free zone of 2,500 hectares. This increased the visibility of the once hunted wild boar and red deer. This area is part of the Veluwe area, the largest natural area in the central-eastern part of the country, with a great variety of habitats. 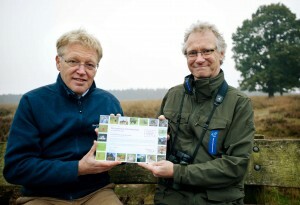 Natuurmonumenten tries to modernise the principles of wildlife management in its reserves. Wildlife watching is becoming more and more popular; people can nowadays encounter and photograph wild mammals at close range as they reach more natural densities and reduce their shyness. Located in the northern part of the country, the Drents-Friese Wold stands out as an area transformed into a more natural forest area with beautiful old oaks. Drents-Friese Wold is also bringing back hydrological dynamics to the source of the stream de Vledder Aa – a small river that was previously channelled but is now given a more natural course again. In addition, Sayaguesa cattle are roaming the area leaving behind their impact on the landscape. On the border with Belgium in the southern part of the country, Natuurmonumenten partners with organisations such as the Belgian ‘Regionaal Landschap Kempen & Maasland’ in yet another exciting rewilding area: the transboundary Kempen~Broek. In this very diverse and biologically rich landscape, missing pieces of land are being purchased or exchanged with farmers to create an interconnected area where groundwater tables are restored, creating wet grasslands and marshes, grazed by large herbivores. The Kempen~Broek hosts one of the Tauros breeding sites, as part of the Tauros Programme of Rewilding Europe and the Taurus Foundation. Natuurmonumenten was founded in 1905 by the two founding fathers of nature conservation in the Netherlands, Jac. P. Thijsse and Eli Heimans. Their aim was to improve the quality of life in the Netherlands by preserving nature, landscape and cultural history. Over the last century, the organization has continued this work through its permanent staff and many volunteers. By acquiring natural areas, Natuurmonumenten protects animals and plants, which are native to the country and enable people to enjoy the countryside by providing footpaths, cycle paths, observation points and excursions. Natuurmonumenten is a society with over 735,000 members, run by a management team, board and a member’s council. As a society, its members have a say in its decisions and policies. As a result of its acquisition policy, Natuurmonumenten now manages and protects 101,066 hectares distributed over 345 areas in the Netherlands. Natuurmonumenten works together with other conservation organisations, provinces, municipalities, water authorities and local residents to create links between people and nature. It also has international connections with fellow organisations in Germany and Belgium. The European Rewilding Network aims to establish a living network of many inspiring rewilding initiatives, in order to stimulate and learn from each other. To date, 41 members located in 18 countries throughout Europe – from Scotland to Bulgaria – joined forces in the Network. During the first two years of existence, successful stories on rewilding and valuable lessons learned have been shared among the members via seven online seminars. During these events, specific rewilding topics were discussed. Such topics included natural grazing with large herbivores, cooperation with local communities and developing wildlife watching enterprises, while the most recent webinar addressed the ‘Circle of Life’: the importance of dead animals in nature. Rewilding Europe continues to welcome new members to the network, as we believe that sharing knowledge and experiences on rewilding will be useful to all who want to be part of making Europe a wilder place. Please feel invited to have a look at how your inspiring rewilding initiative could become part of it at www.rewildingeurope.com/european-rewilding-network/.